I’ve used Twitter a lot for research over the years. When I used to write for clients, I would often go onto Twitter and find relevant information, quotes, and people to include into articles. I still go to Twitter almost every single day as I write for my own websites, as well as for my own information. I’m pretty good at finding what I want to find and ignoring the rest. In other words, I’m pretty good at being productive on Twitter. So I thought I would show you my two big Twitter hacks to keep up with vegan news without costing myself more time than necessary. I do use Twitter normally, where I follow people who have similar interests and keep up with them. But, with the vegan crowd, it can be a little hard to take sometimes. You get people who very high up on their horses and others who share the most disturbing images you will ever see. I’ve seen something images and videos on Twitter that I wish I could just scrub from my mind. They instantly made my blood turn cold and affected how I went about the rest of the day… in some cases, week or month. That’s not very good for productivity. That’s not very good for life. There are some vegans who post a lot about animal abuse. I’m acutely aware of the rampant animal abuse going on in this world, including the horrific happenings in the ‘food’ industry. I personally do not want to see it. I would do anything to help it stop, but seeing the pictures and videos does nothing for my impact on animals. It just makes me bitter and angry and sad – and all those emotions that don’t come with Love or Above, which is where I work and live best from. 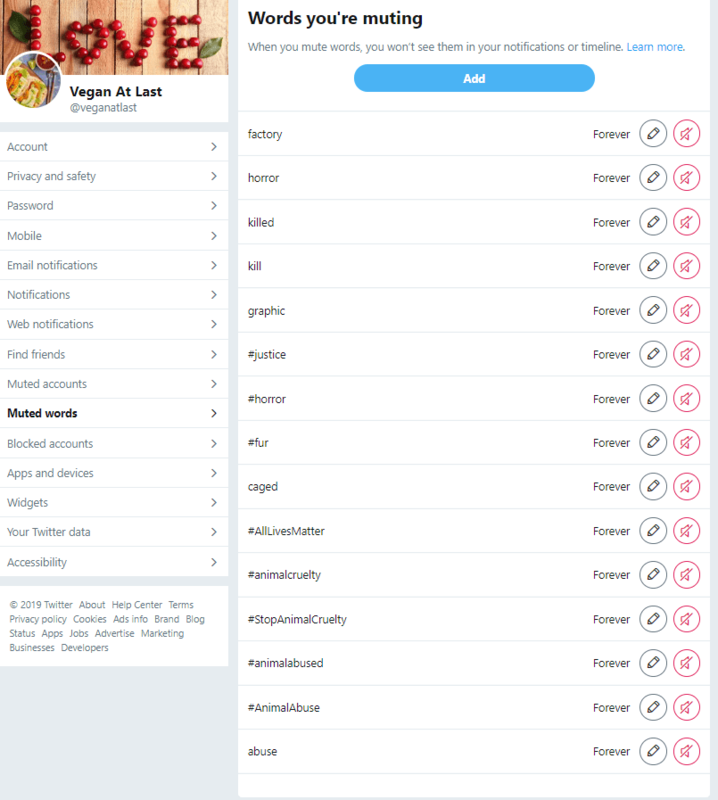 So, to keep myself from going into a negative energy spiral while looking up vegan stuff on Twitter, I make sure to have all the usual words muted. Sometimes I will still come across a graphic image or video that doesn’t contain any keywords, but 99.9% of the time, muting these words has worked. You simply go into your settings and choose ‘muted words’ and then add away! I used to write for a guy who wanted a lot of original quotes in his articles, but it’s hard to come up with original quotes without watching full videos of people talking. I spent hours upon hours watching videos for quotes and getting paid less and less in my day every hour that went by. It was such a waste of time. Eventually, I realized that filtering for verified accounts could help me find quotable people and their quotes quickly. Don’t get me wrong. We all deserve to be quoted, but when you are looking for leaders in a certain industry to back up points or make things more clear, it’s important to be able to find them. You can use this in your searches for vegan terms – or for anything really. For example, if you are looking for vegan lasagna on Twitter, you can filter it to get only results from verified profiles. Simply type in: vegan lasagna filter:verified. Then you can use the results to build an article, build up a list of vegan lasagnas that you want to try, or find new vegan influencers to follow or work with. I often end up adding new people I find on Twitter to one of my Feedly feeds so that I can keep up with them. I’m sure you can think of more things to use this simple little Twitter hack for. It’s so useful. If you are going to use verified profiles for quotes or a source of information that you want to credit, please note that sometimes these verified people aren’t very original. They try to pass off their words as original, but they actually steal them from someone else. To be sure, plug the tweet into google and if someone else said it first, a result will pop up word for word. What Holds You Back From Meditating?